The Space Mutants are the main characters of the series of films of the same name. They are extraterrestrial beings whose sole purpose is to feed on the Earth's populace. Space Mutants are shape-shifting alien creatures. They are fictional characters in the "Space Mutant" movie series. They disguise themselves as humans to attack other humans. They appear to feed on a being's intimacy, as they are most often seen attacking before a couple make love. According to "Space Mutants V: A Land Down Under", they attack other beings, but do not eat them whole, as the girl in the movie questions "what happened to the dingo back there". It is possible that it was dingo mating season, but the mutant didn't care for taste. They seem eat humans entirely, as a pair of worried eyes peek through its mouth in some depictions. 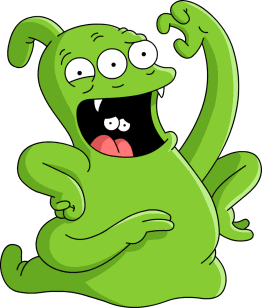 The Mutants are green-colored with three eyes and four tentacle-like arms. They have two fingers and occasionally have one thumb on each hand. A small portion of the head sticks out, like a ponytail. They only have two teeth, showing that, like a duck, they may not chew their food, but rather swallow their prey whole. It may also be implied that they use their former prey's skin as a disguise. They do not have any feet, but more slither, or scoot, around like a slug. 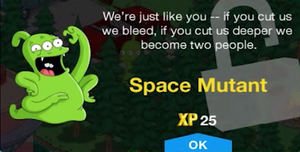 This section is transcluded from The Simpsons: Tapped Out characters/Treehouse of Horror XXV. To edit it, please edit the transcluded page. 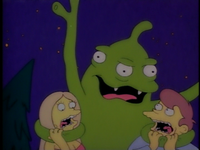 The Space Mutants were partly the basis for Kang and Kodos. Bart Simpson has a small Space Mutant toy on his nightstand. In their movies, the Mutants usually are shown attacking before or after a couple has made love. This, along with the likelihood of large amounts of gore and violence, may account for the movies' "R" rating. In “The Simpsons: Tapped Out”, after the Space Mutant completes a job, it throws up, then re-eats a cat. It also has a job animation where it eats a cat from a dumpster. This could be a reference to “A.L.F.”, a popular television show starring an Alien Life Form who often referred to cats as a delicacy. Simpsons short – "Scary Movie"
↑ Groening, Matt. Commentary for "Treehouse of Horror II", in The Simpsons: The Complete Third Season. Modified on March 14, 2019, at 12:28.